Luis Peón-Casanova graduated from the University of Texas in 1986 with a bachelor of science degree in mass communications with an emphasis in filmmaking. While in Texas, he spent five years producing broadcast documentaries for the Texas Parks and Wildlife Department. He earned a master of arts degree in education at the University of Nebraska-Lincoln. 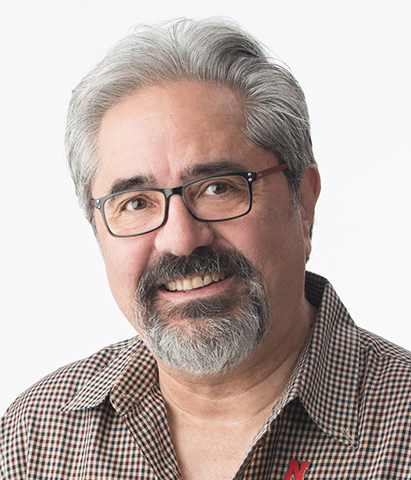 Luis served as an executive producer for the Interactive Media Group at Nebraska Educational Telecommunications (NET) for five years and as a Television Producer/Director for 10 years prior to his current position with the College of Journalism and Mass Communications. His former responsibilities included the management of annual state and federal budgets and the development of new projects. Each year, he independently produced several television projects both for NET and for assorted partners throughout the country, including the Audubon Society, the Getty Center for Education in the Arts, Prairie Visions Consortium, the National Math and Science Initiative, the National Science Foundation, Mutual of Omaha Insurance Company, Nebraska Humanities Council and the National Arbor Day Foundation. He received numerous national and international awards for his productions including "Best in Education" from the Corporation of Public Broadcasting (CPB) in 1995. Luis has developed several international productions in partnership with various University of Nebraska scholars. In 1993, he produced a documentary on early childhood education in China. He assisted in the production of WGBH's Frontline in Mexico City (1988), produced an independent educational documentary in Ireland (1999) and produced a 30-minute documentary for Visions of Democracy, a European Consortium (1998). Peón-Casanova represented the United States as a guest speaker for the III International Meeting on Global Telecommunications in Brazil (1997). He completed the production of two educational television programs (2001), one in Brazil and one in Italy. In addition, he received a CPB Travel Grant (1998) to attend a webcasting workshop and public television conference in Stuttgart, Germany. He received a grant to travel to Brazil (1992) during a 14-day professional exchange through USAID. In 2001, Luis participated as a judge during a distribution screening for Red de América Latina in Uruguay and recently (2007) helped secure funding to produce a documentary in Cuba in partnership with the Department of Anthropology at University of Nebraska–Lincoln. Peón-Casanova currently teaches in the College of Journalism and Mass Communications (COJMC). His classes include: visual literacy, photography, photojournalism, advanced video production and electronic news-gathering. He serves as the visual literacy coordinator represents COJMC in the university-wide visual literacy consortium.